Home » Are We Witness to Another October Take Down of Stocks? As the stock market starts October on weak footing, are we about to find ourselves in the middle of history repeating itself yet again? 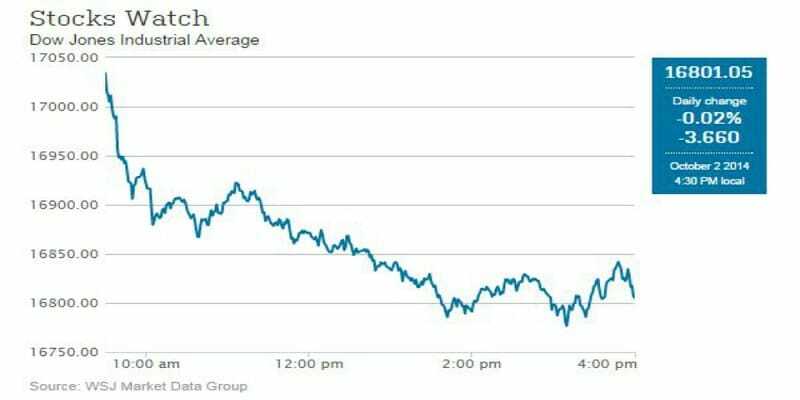 It was a bad October start for the stock market Wednesday. The Dow Jones industrial average plunged nearly 240 points as mixed economic data and geopolitical tensions have spooked investors. And early on Thursday, the stock market was on track for a fourth straight day of loses, but ended in a pause. Friday the Dow regained 207 points. The decline on Wednesday, according to the New York Times and the Wall Street Journal, started with a report showing a shrinking German manufacturing activity, and later stocks took a deeper dive after a report of weak U.S. construction spending and a survey indicating that American manufacturing have slowed down. The Dow Jones Industrial Average lost 238.19 points Wednesday as the S&P 500 Index declined 26.13 points and the Nasdaq Composite Index went down 71.30 points. Could be the month of October. Many of the largest stock market crashes in the past have happened in October – starting with 1929, then 1987, and most recently October 2008, which had two of the worst days for the Dow in terms of point decline. There are also significant concerns about Europe’s economic weakness, and that its effects could spill over into the U.S. economy. And although the U.S. economy is in way better shape than that of Europe, the markets still fear the coming end of the Federal Reserve’s Quantitative Easing stimulus program, which has been forcing down interest rates and inflating the prices of stocks by making them more attractive to buyers than securities. Let’s also not forget that the U.S. dollar – currently considered “strong” on the global stage as it relates to other currencies – can be a mixed blessing. Last month, the dollar reached a six-year high against the Japanese yen and a 14-month high against the euro. A stronger dollar is bad for exports and it makes it harder for foreign investors to spend on U.S. securities. Meanwhile, we have escalating geopolitical tensions in Ukraine, a trade war with Russia, airstrikes in Syria on ISIS targets, Ebola outbreaks in Africa, a confirmed case of the Ebola virus in the United States, and tense anti-government protests in Hong Kong, which have triggered new worries about the Chinese economy. All of these economic and political concerns, along with lower prices, have pushed demand for gold recently. And the demand has come not only from professional investors, but from the world’s wealthy and central banks. Consider a recent article from Alan Greenspan that hints that China may be planning to spend part of its $4 trillion foreign currency reserves on gold to back their yuan and surpass the United States as the biggest state holder of gold. Why are the rich and central banks hording gold? The fear of loss. Over the course of history, gold has proven to preserve wealth, and even in more recent times, it has provided some level of diversification and protection from major crashes in the stock market. Stocks and bonds perform well in stable political and social conditions, and while the United States today may seem like the one of the few places to offer these conditions, we live in an increasingly interconnected world where problems in one continent can spill overnight into the whole world – just like in 2007–2008 crisis when our problems became the world’s problems. Why is the price of gold low? “The rigging in the gold price in New York and London is accomplished by a handful of major bullion banks that just happen to be the biggest shareholders of the Federal Reserve,” Taylor told the Market Oracle. Taylor believes there are two main markets for precious metals: the honest market for physical gold and silver and the paper market, which has become increasingly dishonest in its attempts to “muddy the waters” and manipulate gold prices. Do you think that the stock market and the price of gold are rigged? If you do, you should perhaps consider investing in gold, which has been used for storing value and wealth for millennia. Request our free investment kit to learn how, or follow us on Twitter to keep up with the latest news about precious metals.